The Deluxe Double Rooms are equipped with a queen-size bed as well as a traditional sofa. 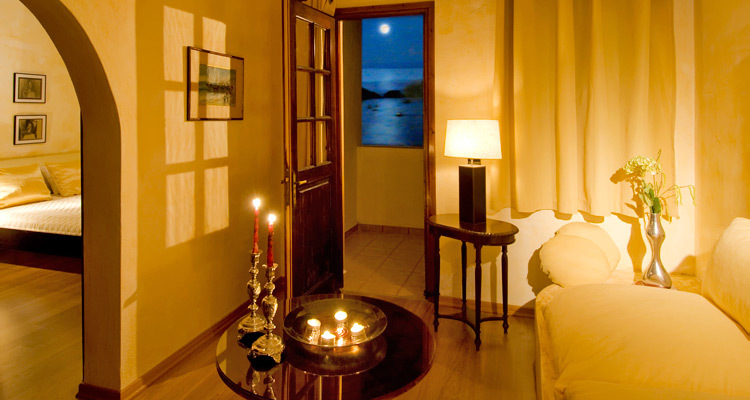 All of the Deluxe Double rooms offer a magnificent sea view of the Aegean Sea and the scenic bay of Grikos. 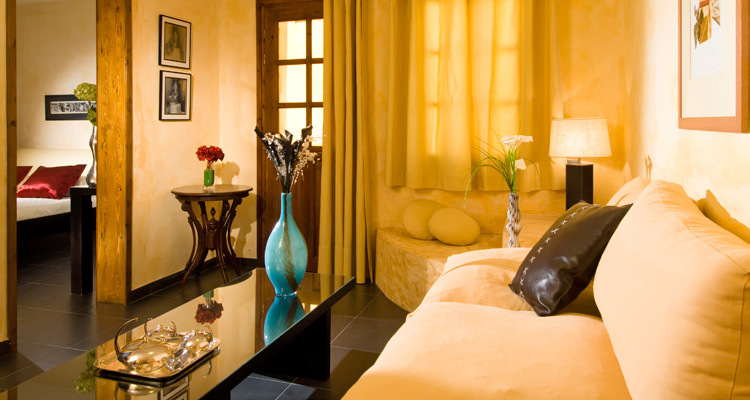 Our suites include one room equipped with a queen- or king-size bed and a second room serving as a living room. The suites are situated on the upper level of the hotel, and feature more spacious rooms and even more upscale decor and art than the deluxe double rooms. 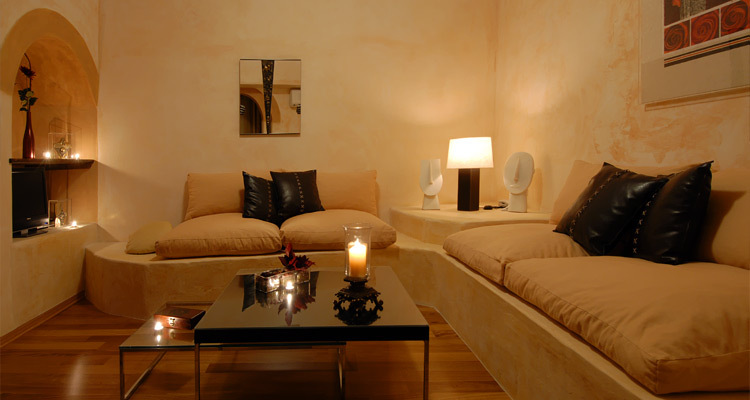 We recommend our suites to guests who want to enjoy a more comfortable stay in our hotel. 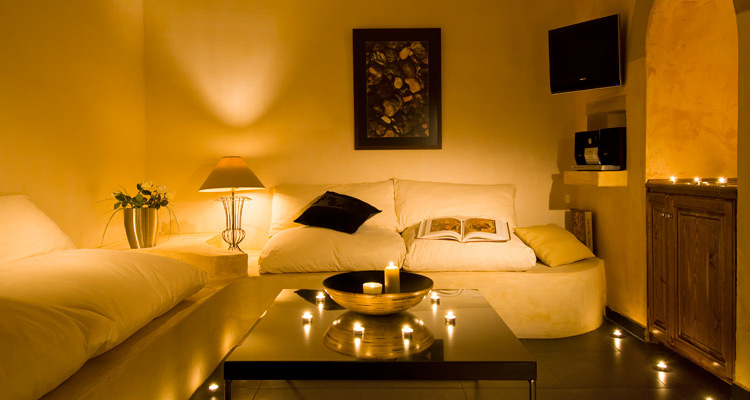 The living room of our suites may be transformed to accommodate up to two children. Our Honeymoon Suites, decorated in romantic fashion and elegantly dressed with hardwood floors, consist of a living room and a bedroom equipped with a queen-size bed. The Honeymoon Suites also feature a hydro-massage bathtub, as well as a private balcony offering a wonderful sea view of the Grikos Bay. One of our honeymoon suites offers an open-floor arrangement, while the other consists of a living room and a bedroom separated by a door. Our Superior Suite, the second-best room type of our hotel next to the Petra Suite, offers a spectacular view of the Grikos bay and consists of two rooms separated by a door: a living room and a bedroom. Its spacious bathroom is equipped with a hydro-massage bathtub and its overall decoration and comfort is superior to our standard and honeymoon suites. 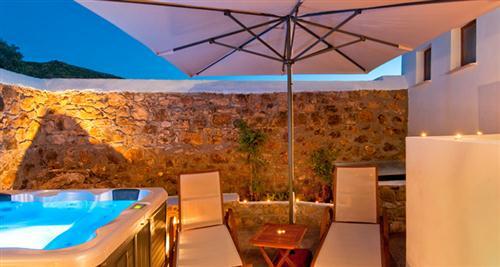 Arguably the greatest asset of our Superior Suite is its lovely patio: a traditional Patmian yard with lovely flowers and trees that embrace an exterior jacuzzi and sun loungers, an area that invariably enchants our guests with its authentic feel and relaxing environment. The Petra Suite, the most spacious and ultimately luxurious room type of our hotel, is decorated in unique fashion and includes one room equipped with a queen-size bed and a second room serving as a living room. The Petra Suite is also equipped with a walk-in closet and two bathrooms, one with a shower and one with a large hydro-massage bathtub that can accommodate two people. 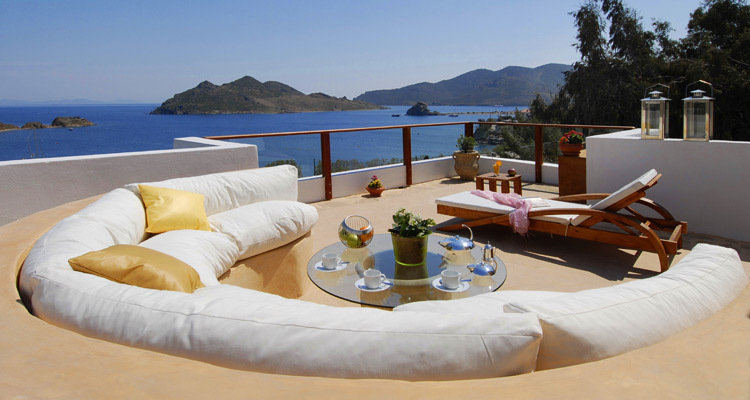 Arguably the Petra Suite's strongest asset is its spacious private veranda, offering a sight for sore eyes: two lounge chairs, a built sofa with comfortable pillows, a dining table, as well as a round table that provides additional comfort allow you to relax in privacy while enjoying the breathtaking view of the Grikos bay. The Petra Suite is incomparable to any other room type in our hotel in terms of space, comfort, amenities, and decoration; hence we recommend the Petra Suite to guests celebrating their honeymoon or getting married on Patmos as well as to travelers who wish to have ultimate comfort during their vacation. walk from Grikos Beach where tavernas serve traditional Greek food.